Chinos are increasingly an essential part of any man's wardrobe, offering a smart-casual look that works whether you're on the beach, in the office or at the palace. In this article, we find chinos to suit every budget from pauper to prince (yes, we have gone a little royal wedding crazy. Don't worry, it will pass). But first, what's the difference between chinos and khakis? Unless you're in the army, you'll probably never need to care. Both chino and khaki are terms that originally come from military clothing; chino is a type of twill cloth while khaki refers to a sandy brown color. So confusingly, you can have chino cloth in a khaki color. You'll find smart casual cotton trousers in pale shades called all sorts of things. Here are some that we recommend. Chinos have now become an established feature in the office environment, originally for a 'dress down Friday' but now they are widely accepted as business clothing, maybe worn with a blue Oxford shirt or another shirt with a collar but no tie. Chinos with a pleat give a slightly smarter look but risk making you look a bit nerdy. Style-wise, chinos are now available in a 'five pocket' style, the same as you see on jeans. These are rather more casual than the normal version with side pockets in the seam. If you really want to look your best, why not get chinos tailored to your personal measurements for the ultimate fit? Read on for some more tips. The Tailor Store offers a wide range of options for size, style and colors and delivery in 2 - 3 weeks, made in Sri Lanka. You can order a pair of chinos customised to your personal measurements that is about the same cost as buying a pair at full price in a high street store. I have personally tried these and was happy with the fit and service. The chinos had nice deep pockets and you can choose a high waist which, although it is not quite so trendy, is perfect if you want to be sure your shirt does not come untucked! 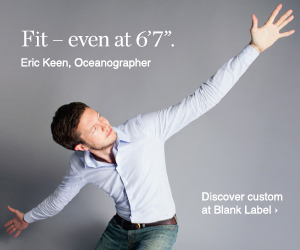 Blank Label is another brand offering personalised fitting and a slightly more 'on trend' offering. Hailing from Boston, where a smart pair of chinos (and a blue shirt, also available from Blank Label) is the essential smart casual outfit it seems that everyone wears. I tried their fitting room in Boston where I was measured personally and the chinos appeared a few weeks later from China. Some slight modifications were needed but Blank Label was extremely helpful and the chinos were well made with some nice details like an elastic band inside the waist to help keep a shirt in place (no stretchy wasitbands here!). Another tried and trusted brand for chinos / khakis is Dockers. Like their parent company, Levi's, Dockers have big and tall sizes which means that you can get a 38 inch inseam although mainly in larger waist sizes. I have several pairs of Dockers that have passed the test of time well. Because of the free delivery, I generally look for them first at Zappos which has some tall options but you can also buy directly at the Dockers site. For those looking for something a little more stylish, a relatively new name in men's smart casual clothing is Bonobos. Formed by a couple of business school chums, the company has gone for quality clothing with a few distinctive touches that make their clothes stand out. They have recently expanded their sizes to include a number of styles with a 36 inch inseam and their customer service is reported to be excellent. Other reliable options for taller men include Gap and its upmarket brother Banana Republic but you can also find tall options in Lands End and even (since I promised something for paupers) Target. Lands' End Classic Pleated Front Chino are a safe bet, although if you are after something a little longer and a little more elegant, Charles Tyrwhitt offer chinos in a variety of styles with a finished inseam of 36 inches or an unfinished inseam of 38 inches. You may also find that some larger Gap stores stock chinos/khakis in a 36 inch inseam. In other countries including the Netherlands, WE stocks chinos in inseams up to 36 inches in stores.